1000 Books Before Kindergarten is a global initiative that centers on early childhood literacy. 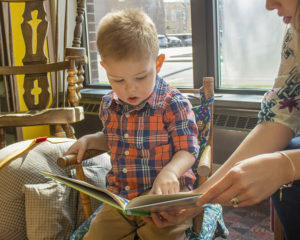 Studies have shown that infants and toddlers exposed to reading and stories have improved language and vocabulary skills, which will boost their education by the time they’re ready to attend kindergarten. Read a book (any book!) to your newborn, infant, and/or toddler. 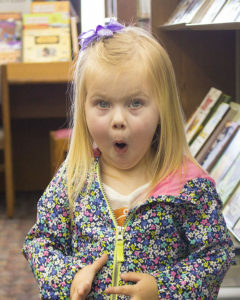 The goal is to have your child read 1,000 books before they start kindergarten. It may sound hard, but it’s easier than you might think. A book a day means you can complete the project in less than 3 years. 3 books a day means you can complete the project in less than a single year! Since most children begin kindergarten around age 5, there’s quite a bit of time to get 1,000 books read. 1,000 books is a LOT! Visit either the Huntington or Markle library to officially begin the program. You will get your first reading log sheet – each sheet tracks 100 books. For each book read to your child, color in a book on the reading log. When all 100 are colored, bring the sheet back to the library and receive your next reading log, as well as put a sticker on our 1000 Books Before Kindergarten display to mark your progression to the next phase. There will be a small prize at the halfway point (500 books); when 1,000 books have been read, each child will get a free book and their picture in the local papers to show their accomplishment!